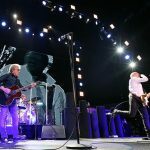 Who needs Desert Trip when The Who, Paul McCartney and Roger Waters all made the Midwest rounds a mere of couple hours apart from one another within a 48-hour period? 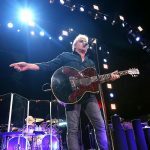 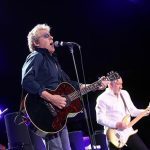 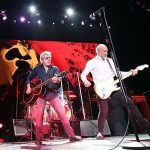 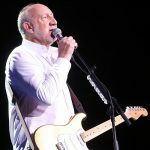 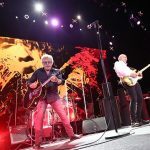 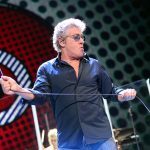 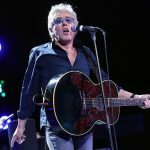 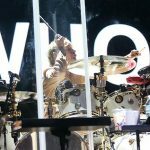 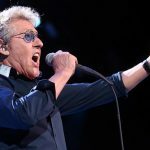 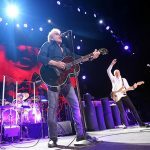 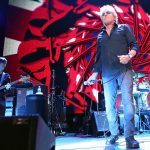 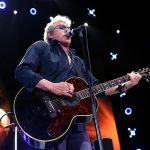 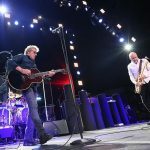 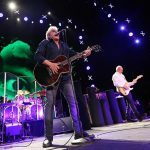 While Roger Daltrey, Pete Townshend and their immaculate backing cast’s appearance at a packed-to-the-brim Van Andel Arena in Grand Rapids didn’t have quite the same magnitude on a tour simply being billed as “North America/South America 2017,” it did have a special significance in the fact that Michigan was the very first state where one of the British Invasion’s most beloved bands first broke on stage and radio. 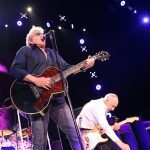 Following a boisterous set from The London Souls (think The Black Keys meets Lenny Kravitz), The Who knocked out “I Can’t Explain” and “The Seeker” with even more gusto than expected, along with a surprise snippet of “Happy Jack” dedicated to The Great Lake State for giving them the time of day way back then. 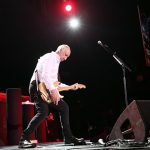 Had that traction never happened, who knows if the band would still be coming to the States 53-years after first forming, though anyone privileged enough to catch the Rock and Roll Hall of Famers on this particular night (with frequent jumbotron salutes to the late Keith Moon and John Entwistle) surely stood by their listening investment. 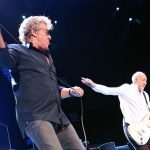 Taking shape as basically an updated extension of the The Who Hits 50! 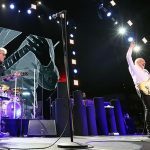 outing, the two-hour evening was packed with classics and rock opera remembrances, which considering The Who has so many of each, it was easy to loose count. 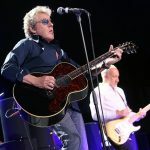 However, it was impossible to forget any of them, especially anthems such as “Who Are You,” “My Generation” and “Bargain” thanks to the world’s best microphone whipper and the ultimate windmill man sounding superb at 73 and 72 respectively. 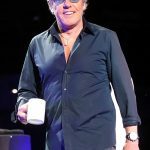 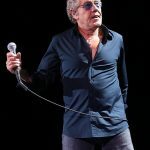 The only snag came at the conclusion of “You Better You Bet” (ironically the song that screams “my voice too rough with cigarettes”) when Daltrey tersely warned whoever was smoking that it was making his voice raw. 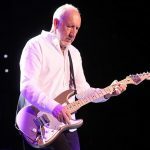 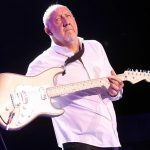 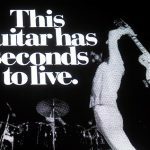 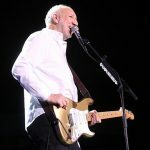 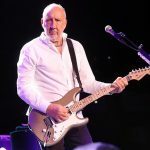 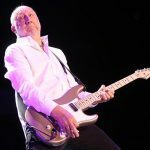 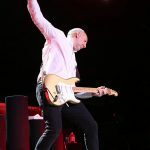 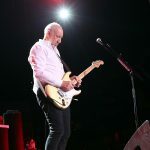 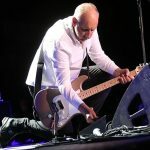 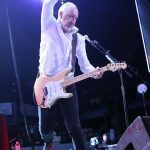 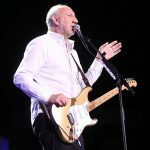 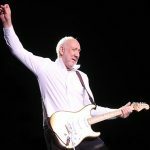 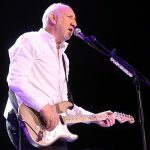 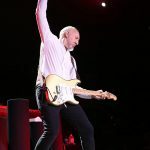 After a few tense seconds where his eyes darted to the backstage door, Townshend briskly switched subjects to an introduction of the rarity “Relay,” explaining how he envisioned virtual reality and the internet concept as early as the ‘70s. 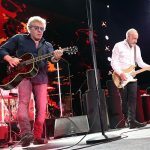 From there, it was smooth sailing for these lyrical and musical masterminds, who turned in a block of treasured selections from Quadrophenia (“I’m One,” “The Rock,” “Love, Reign O’er Me”), jumped up to the ‘80s for the charging momentum of “Eminence Front,” then bounced back to a quartet of tunes from Tommy. 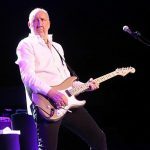 “Pinball Wizard” came across the most potently, while also serving as one of The Who’s most absorbing examples of big screen visuals. 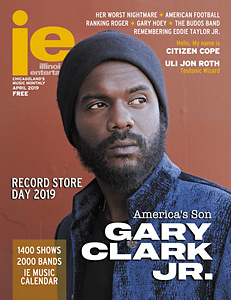 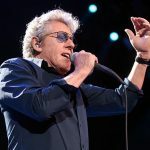 But no amount of exploding arcade games could top the real life sing-a-long evoked by “See Me, Feel Me” and the sheer euphoria surrounding “Baba O’Riley,” complete with Daltrey on harmonica and Townshend kicking his way to its climatic crescendo. 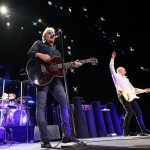 Although any of those selections could’ve easily closed the concert, “Won’t Get Fooled Again” exponentially punched up the roar and found the survivors at the absolute pinnacle of their latter era performance powers. 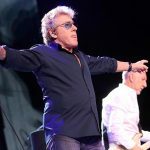 They may have once hoped to die before they got old, but having Daltrey and Townshend carrying on the group’s legacy has ensured every subsequent generation gets a chance to experience precisely why The Who have lasted this long.